Congratulations to Ray Gaddis, who is now tied for the club record for appearances. 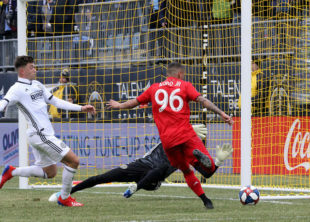 Has Kai Wagner been the Union’s best offseason signing so far? There were a number of individual milestones Sunday night in Atlanta. Brenden Aaronson reflects on his debut, but will we see more of him? Patrick Bohui becomes the youngest player to appear for Steel or Union. Wayne Rooney is the MLS player of the week after his hat trick. The MLS Team of the Week is here, and still no Union players make the team. The Union are featured in the Top 10 plays, but not in a good way. Watch Allianz Field be built from start to finish, or watch the liquor store parking lot fill up in front of the stadium. Greek league match abandoned by fan clashes. Argentina has granted its Women’s League professional status. Soccer still needs work with head injuries, as David Ospina is recovering after collapsing after head injury during game. man, i was like “whoa, that liquor store is gonna do some mad business when that field opens” only to see my hopes demolished.